The early history of the band is somewhat sketchy, and not as clearly documented as that of the Essex Yeomanry Regiment itself. Although trumpeters were used by all cavalry regiments as a means of giving commands, the first real evidence of an Essex Yeomanry Band (then on horseback), was recorded in 1809. In 1830, the Commanding Officer of the West Essex Yeomanry was financially supporting the band out of his own pocket. An engraving of 1846 shows a black drummer mounted on a white horse, sporting a plumed turban. The other mounted bandsmen wore the Yeomanry uniform of the period. In 1877, the West Essex Yeomanry reformed and became the Waltham Abbey Town Band, continuing to wear the Yeomanry uniform. The Essex Yeomanry became gunners in 1921, but still retained the band. The musicians were now dismounted, but continued to entertain all those who heard them play. By 1937, the band was in full dress uniform of the Regiment, complete with plumed brass helmets. During the 1939-45 war, the Essex Yeomanry Band was disbanded, but reformed again in 1947. This was a difficult time for the players, as all the uniforms had been destroyed in the bombing of Chelmsford. In 1952, official recognition of the band was given by the War Office, but like the regiments was sadly withdrawn in 1968. In the early 1980s the band took a controversial step for the time and accepted women musicians, we even had to design a special uniform for them. Now more than 50% of the band are female. The band continues to have a close relationship with the Essex Yeomanry Regiment and a member of the Regiment acts as our President. As a result of hard work given by successive Directors of Music and the loyalty of musicians, the band now operates on a self-supporting basis. Members pay an annual subscription towards the band's upkeep, together with income from other concerts. The band plays at occasions ranging from public concerts to garden parties and special events. Greg studied music at the Colchester Institute Centre for Music and Performing Arts where he was tutored in tenor trombone with Helen Vollam, piano with Francis Reneau and voice with Tarsha Cole. He became interested in conducting and studied under Christopher Phelps (himself a student of Herbert Von Karajan). Greg conducted both the Brass Band and Symphonic Wind Orchestra whilst at Colchester, working for two years as Student Leader of the Symphonic Wind Orchestra. Leaving music college, Greg undertook teacher training at the Institute of Education, University of London. He kept his hand in working as a freelance teacher and conductor for Thurrock Music Services, conducting and organising their own Concert Band and Brass Ensembles as well as working as an Instructor and relief Conductor for the Romford Drum and Trumpet Corps. 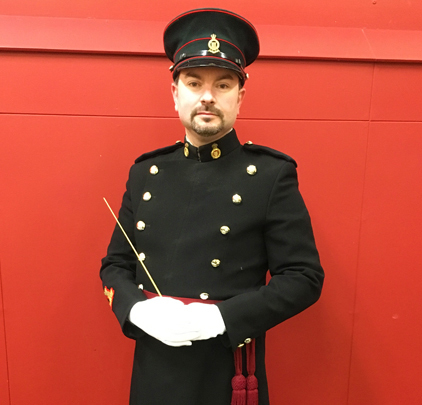 Greg is now Director of Music at Brentwood Ursuline Convent High School, is Musical Director of Thurrock Spectrum Brass and holds the positions of Bandmaster and Solo Trombone with The Tilbury Band. Joining the Essex Yeomanry represents a considerable investment on our part. Each uniform costs us £500 and we often have to alter clothing to fit new members. We try to avoid the pressure of formal auditions and you are welcome to join us for rehearsals although not necessarily to perform in concerts. Once you have demonstrated a commitment to us and we feel that you would be a valued member of the band, you will be formally invited to join. You must play to a reasonable standard and be over 16 years old. We are particularly looking for brass players but woodwind players are welcome too. We do not hold formal auditions – come along and try us out! Use the Contact Form to let us know you're coming as we do not rehearse if we have a performance that week. Rehearsing with us does not automatically entitle you to join the band. If the band committee approves, you will be formally asked to join the band and you'll be provided with a uniform. Band members pay a subscription to contribute towards our costs (discounts are available for students). The band rehearses from 10am–12.30pm on most Sundays. We do not hold a rehearsal if the band has been performing that weekend and we have a break for August and Christmas periods. Rehearsals take place at New Hall School, Boreham, Chelmsford, Essex CM3 3HS. On entering the main gate, keep left, follow the road and park alongside the primary school. We'll let you know about our concerts and keep you up-to-date with what's going on. Just write your details in the contact boxes and state in the message panel that you want to become a Friend of the band. You can also use this form to send other messages too. If you'd rather phone us, call: 01375 642891 and leave your name and number. The details you provide will be hosted on MailChimp.com and only used by Essex Yeomanry Band to contact you from time to time. All information will be kept secure and confidential and will not be passed on to any third party organisation. You can unsubscribe to emails using the link at the foot of each message.